So I got a text from my friend with the speedboat asking if I wanted to go out to the big Lake (Lake O) to try our luck at catching anything, so I agreed. We set out this morning. Plan was to start by 6:30am but was 7:30am by the time we left the ramp. if you read my report last year, you will remember that we tried this last year with no sonar, no down-riggers, no real experience and were rewarded with 3 nice steelhead. This time, we had manual down-riggers, but still no sonar. We used the navionics app and it was somewhat useful. Anyways, we setup 2 rods, one at 40 feet deep with a gold Williams wabbler spoon, and I set mine at probably 20 feet deep (no line counter on my side down-rigger) with a Williams whitefish spoon I bought for ice fishing. As usual nothing for the first hour and then my rod starts bouncing. I grabbed the rod and struggled to get it unclipped from the clip, but finally got it released and reeled in a beautiful salmon. Not big at all, probably 3-4 lbs but a fish nonetheless. We trolled for another 2 hours but no luck after that. All in all, a great morning on the calm waters of Lake O. 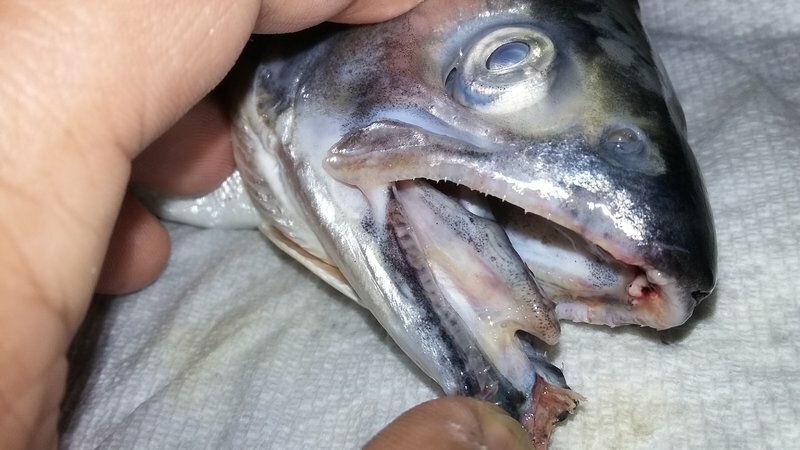 By the way I need you guys to confirm it is a salmon or steelhead since the inside of the mouth was blackish including the tongue. 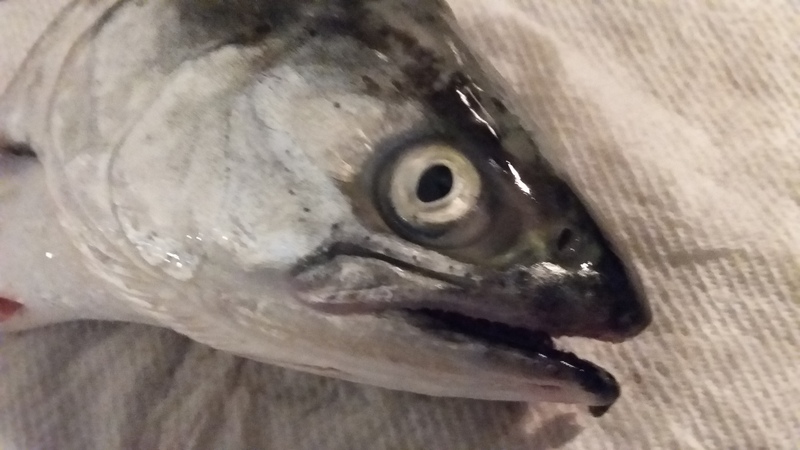 the steelhead I caught last year had white color mouth. That's difficult to ID with the shadow over the mouth but it is 100% not a steelhead/rainbow trout. It is 100% Salmon. 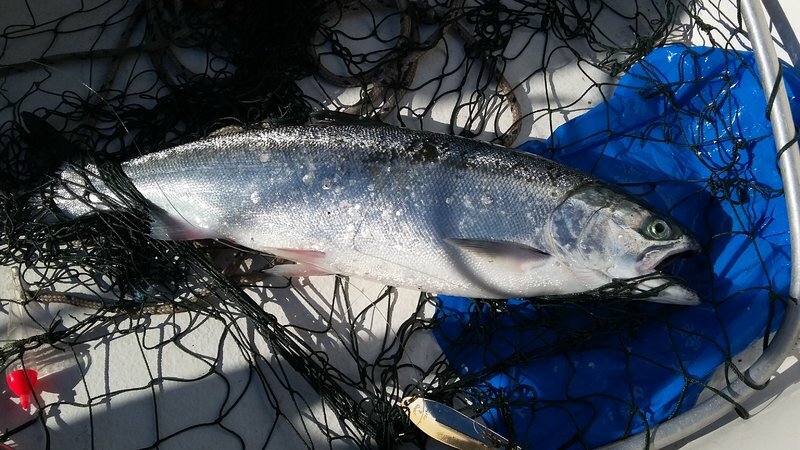 Coho or Chinook. I still keep a printed copy of this guide onboard after 10+ yrs of fishing LO. 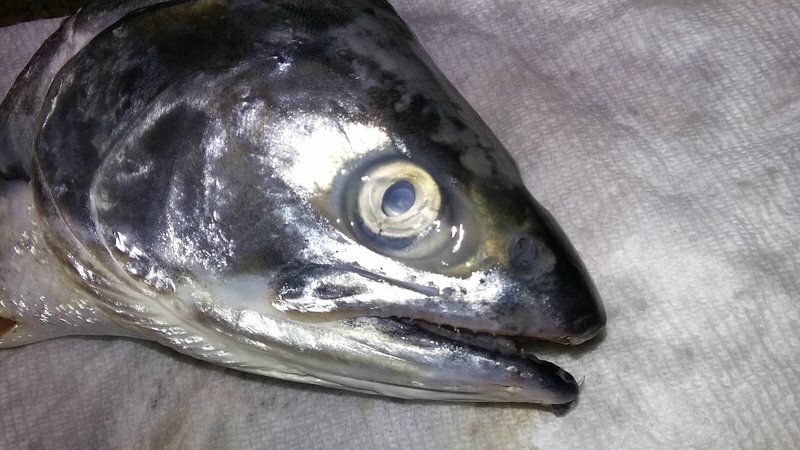 Thats what I thought as well that its a salmon after noticing the color of the mouth. was not light color like the rainbows/steelhead I caught last year. I'm no expert on Salmonids. I was told if it's lips aren't black it is a Trout. 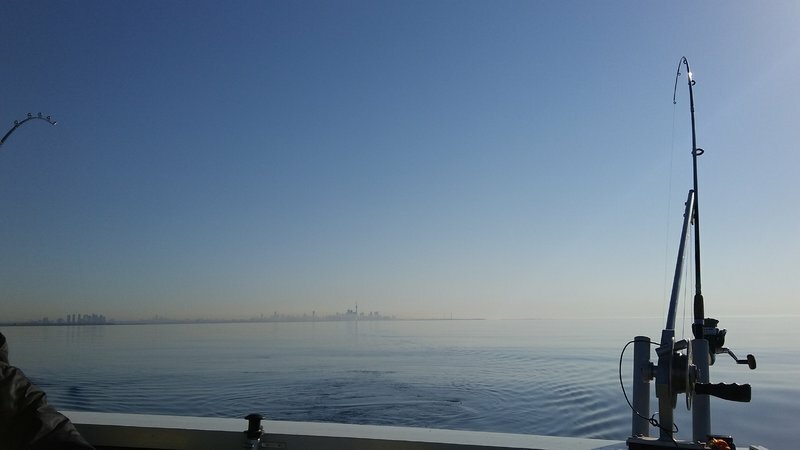 2 guys in a speedboat trolling for fish on Lake Ontario. You don't see that everyday. But there was a time we fished out of a Speedboat with 300 horse strapped on the back on Erie for Smallmouth. We turned plenty of heads at the ramp for sure. One of those Bass Boats are nothing more than Speedboats with fisherman in them. 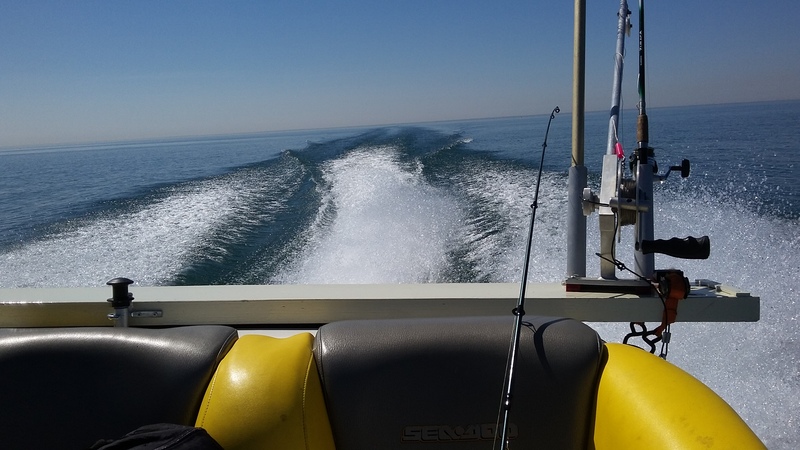 I look at Sonar and GPS as a safety tool as much as I do a fish finder. Been caught more than once in pea soup without a compass heading. I don't even want to think what we would do if we didn't have GPS. Tell your buddy he has to invest 500 bucks in a combo Huzz. 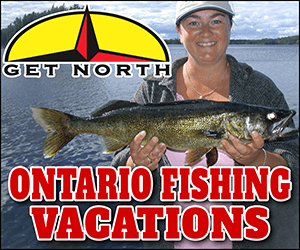 It's in your best interest to chip in towards it especially if you are going to go out on big water with him regularly. You guys are fishing blind. I don't know anyone with a boat that fishes that doesn't have at least Sonar today they are so inexpensive now. A buddy picked up a nice Humminbird colour combo at the Hamilton Swap meet for 200 bucks including an ice fishing set up. You're absolutely right that we need to invest in a few items.we did have GPS and all other safety equipment and stayed within sight of where we launched. We used the navionics app to check the depth we were in and kept adjusting the depth we were fishing to avoid snagging the bottom with the cannonball. I am pushing for him to get a sonar unit more so for the safety reasons you mentioned. I may just give him mine since I plan to buy a new one for ice fishing. Huzzaba, your fish is a young chinook - 100%. you can get a humminbird 700 series GPS Sonar with down imaging for like $400 from the US bass boards easily. A lot more reliable then navionics on your phone, plus you will have a really excellent sonar. Thanks for the suggestion. I will pass it on to him. Any good cost effective lowrance units out there? if you are really into lowrance, the hook 7 is a good affordable model to look at. HDS might be a bit too complex and out of your price range depending on generation and features youd want. Nice going! Sonar with a GPS really helps. Look for the depth you see the fish at then drop your ball in the zone.